Hello there fellow lua-ers... love-ers. 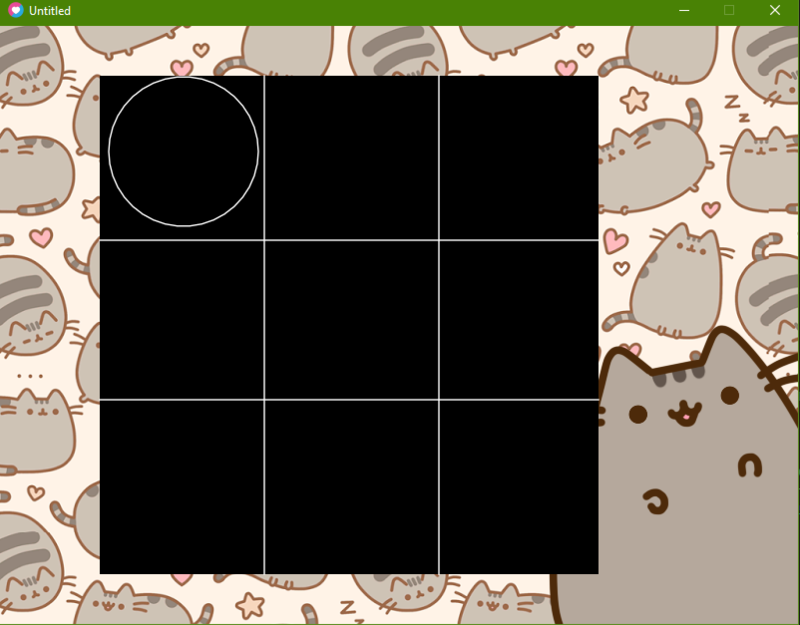 I recently got into lua and was wondering the best way about making the tictactoe board for tictactoe... Except mine is called kittytactoe but that's besides the point. So far, I have done this. TLDR I made a rectangle, filled it, and made some lines but it was a very.. how do I say, random process due to the pixel approximations for where the lines should go that I ended up making. I'm pretty sure this isn't the best of ways to go about making the board itself. game mechanics and go back to that later. I also have a question about mousepressed. The way I am using it here makes the circle appear on the screen but of course it's just in random pixelated areas that can be anywhere which is why I was wondering if I needed to fix my game board or fix my mousepressed. I'll have a screenshot so you can vizualize what i'm talking about. Also sidenote, I guess what I'm really interested in NOW after an hour of thinking is, Is there a way to make an array of rectangles instead of doing.. what I did? I understand how to make one of them but how about 3 by 3 grid of the same rectangles/squares? To be fair, the one rectangle and 2x2 internal separator lines worked perfectly fine, but it seems to me that your issue is more about how to position things in a general sense, than anything. Use love.graphics.getDimensions to get the width and height of your window, then position everything relatively using that. 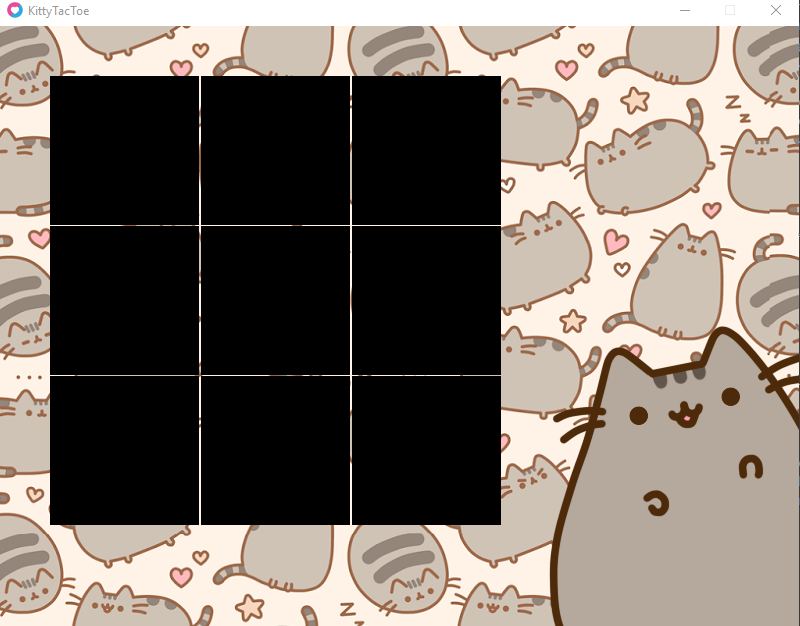 let's say you want the tic-tac-toe board centered, so you know you want a black rectangle in the middle, with a size taking up x% of the width and y% of the height, and you want to separate that into 3 parts with two lines. A little bit of math, and you now know the numbers to plug into the functions you've been using. As for the crosses and noughts, you'd need to test for where the click happened; if it was inside the board, figure out which cell, and draw a perfectly positioned shape into it, using already stored coordinates for the circle and line functions (cross can be done with two lines, and is probably the simplest way to do it) and not just using the mouse coordinates where you clicked. wanted the rectangles to start. (at like, 100, 100 as coords) and the 200, 200 at the end were just the dimensions of each cube/square. I must have misunderstood when I tried to do this. I found this info on the... gridlocked lua love page which was helpful in getting the general idea of what you have just shown me. But, still confused as to why mine wasn't acting the way I wanted it to. Thank you in advance if you mind explaining why mine is busted? and can you explain this line? If i'm following this correctly, x which has been set to 1 and y which has been set to 1 are multiplied by the cell size x and y are both 100 pixels large? The subtracting 1 from each of those is another thing I am confused about. Why is this necessary? Thank you in advance. So my grid doesn't really matter all that much. Getting the width and the height of the window is probably a smarter way to go about positioning things. I had tried to have the mouspressed just set to coordinates that I had already found with the circle. Though, yes you're right. I need to test where the click happened not just using the coordinates. I will get back to this when I have made some improvements to my code. Thank you by the way. I was wondering how to keep my mousepresses inside of the squares. I have the coordinates written down on a piece of paper of the positions but I didn't know if using them would be a good idea. so I ran into the problem where manipulating the cellSize does move it further on the screen than intended which make sense but is there a way to stop this? 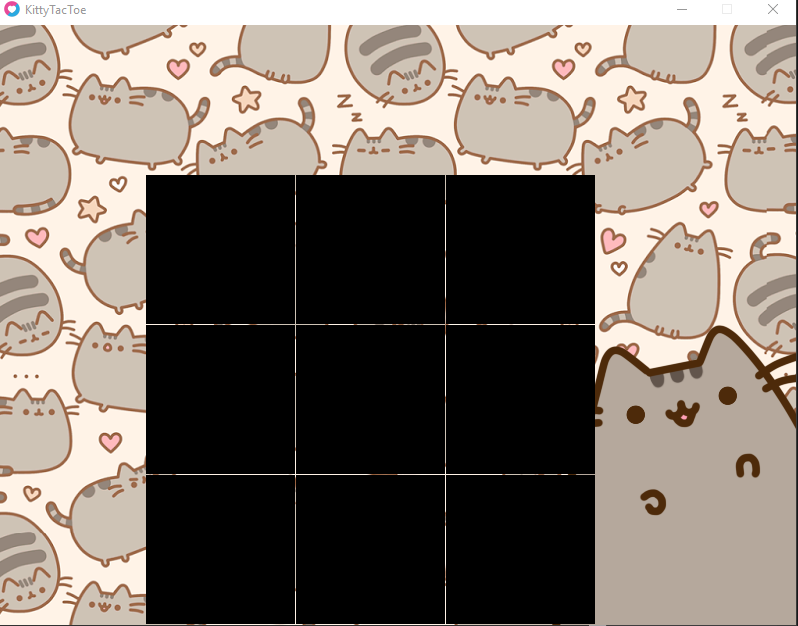 Oh i figured it out here is what I have so far as the grid goes. I used both of your guys' advice with cellsize and width and height and managed to do some math to get this where I want it. I will get back to this for the mousepresses thank you all so much so far.